Solange Knowles was a stunner at the American Ballet Theatre Opening Night Fall New York City Center Gala, in this modified 17th century style Dolce & Gabbana Cherub Print Silk Dress from the Autumn/Winter 12. The dress features 17th century style art mixed with floral details. Solange accessorized with Lorraine Schwartz gold diamond rosecut drop earrings, gold diamond bracelets and gold diamond rosecut ring, three OFIRA gold diamond ball bands, and a black Diane von Furstenberg clutch. She finished the look with a pair of Dolce & Gabbana Embellished brocade Mary Jane pumps encrusted with crystals, faux pearls and gilded leaf details. I am so glad that she decided to go with a modified version of the dress and get rid of the puffy sleeves. The sleeves made the dress look too much like a costume. She made the shoes come to life because I would have never thought twice about buying those shoes because I don’t like the shape of them. They look better on her feet. Lovin’ the smoky grey/blue eyeshadow, red lip, and sleek hairdo. This look is modified perfection. Solange Knowles decided to expand her brand even further by signing a modeling contract with Next Model Management. Solange is not new to this modeling thing she has modeled for Armani Jeans and her sister Beyoncé clothing line House of Dereon. 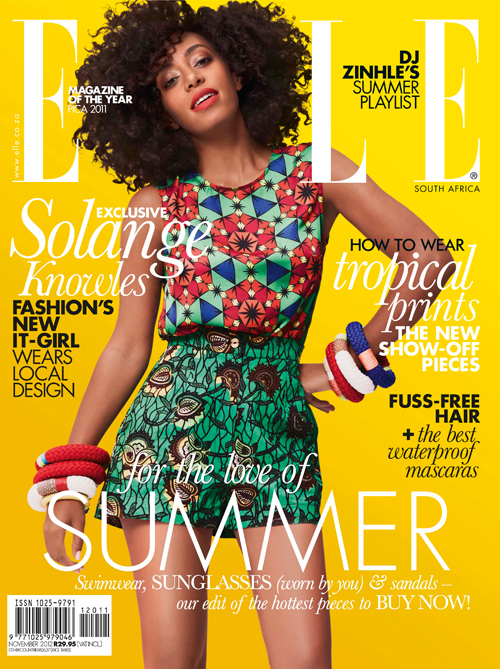 Solange is also a face of Rimmel London and Carol’s Daughter. I am a huge fan of Solange’s fashion sense because she wears what she wants to with no apologies. Vogue UK called Solo the “next big thing,” and I agree. Next Model Management global publicist Katy Moseley had nothing but great things to say about Solange. Leighton Meester wins this round. I love the fact that even though the shoes and skirt could make a statement separately together they mesh well because of their color schemes. While I also like Solange’s look I think it is plain in comparison to Leighton’s look. Both ladies wore the Burberry Prorsum Verulam Beaded Leather Sandals on separate occasions, but the question is…Who’s Got style? Vote below. Solange Knowles and a host of other guest attended the Burberry Body Launch event at Burberry on October 26, 2011 in Beverly Hills, California. Solange donned an entire Burberry outfit which consisted of a printed shirt, printed high waist skirt and fab wooden bead sandals. From her hair to her skirt screams 1970′s and I love it. She ditched her Diana Ross afro wig to showcase her own. This is definitely Solo’s style.